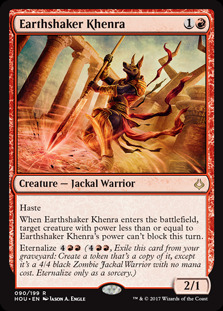 Standard is in need of a huge shakeup! The format has been solved thanks to the power that is energy, and thankfully, Rivals of Ixalan is just around the corner! 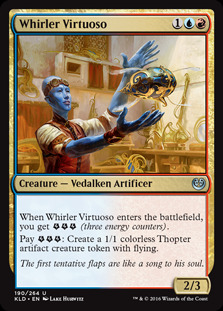 We're getting some cool new cards and MTGO is getting a sweet preview day which you can find more out about here, it looks like a Streamer Showdown, but puts more focus on the individual than a Showdown does. Should be pretty entertaining! On January 11, we're getting a special one day league, with some participation prizes, and that should be pretty great before we head out in to the real world to play with the newest cards of the set! Anyways, that is also covered in the link I shared, so you for sure should check that out, but first, finish reading about our sweet preview card! Back to Rivals of Ixalan though. I did mention that the energy mechanic has made Standard a bit boring, and today's preview card does not really do a ton against it. 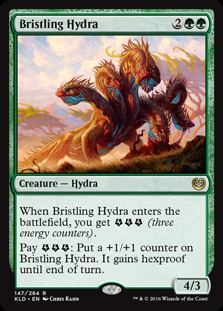 Sure it answers stuff like Rogue Refiner , Servant of the Conduit , and tokens made from Whirler Virtuoso , it leaves stuff like Longtusk Cub , Glorybringer and Bristling Hydra behind. That's not super great when you look at it like that. 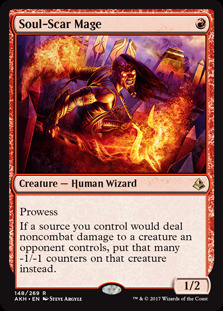 While this card is not the miracle answer all the Standard players are asking for, it's really solid in regards to another deck that sees a ton of Standard play, Ramunap Red. Let's not wait any longer, here is our preview card, Golden Demise! What we have here is another in a long line of Infest variants. These cards have seen a varying degree of play in past Standard formats. 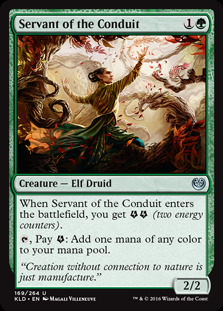 Some, like Flaying Tendrils or Drown in Sorrow see more play than others, but they are a welcome addition to the Standard format, because it's nice to have a three mana mass removal spell, even if it is a bit conditional. Bontu's Last Reckoning does see some fringe play after all! When we get these spells, it's important to note if the spell itself has one of the set mechanics tacked on to it. 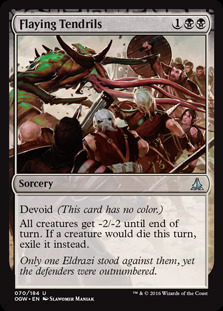 Flaying Tendrils was colorless and exiled creatures that died. That was super good! Drown in Sorrow had Scry attached to it. That was also good! Biting Rain had Madness added on, so it made it cost three, but it really cost mana, so it was played considerably less! We do have a mechanic added on, and this time Ascend is on the card, and it takes this Infest variant and really kicks it up for us in the later stages of the game. Ascend by the way, does this, and I am simply copy and pasting from the email that was sent to me. "If at any time you control 10 or more permanents and control something with Ascend or cast something with it, you get the city’s blessing for the rest of the game. It can’t go away. You did it. From then on, some cards will have more powerful effects if you have the City’s Blessing." When we have the City's Blessing, Golden Demise only hits our opponent's creatures! It's a one sided wrath in the late game, but a symmetrical one in the early and mid game. That's fine! We get to build our deck around the power of this card! We want to remove our opponent's early creatures, get some room to breath and also keep them from getting closer to getting the City's Blessing. If we can take out a board of Earthshaker Khenra , Soul-Scar Mage and Ahn-Crop Crasher that seems really good! We've also seen some incredible cheap creatures spoiled in Rivals of Ixalan already as well. Vampires are set to get a bit stronger, as they get a 2/1 for W and a two mana lord. 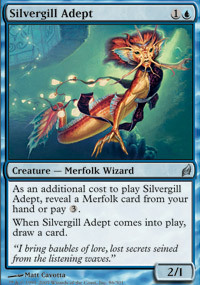 Merfolk is getting Silvergill Adept and a 2 mana lord. 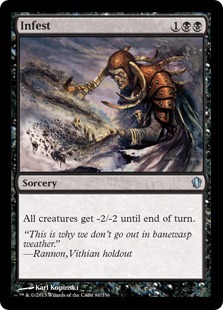 With what has been spoiled so far, the possibility of other aggressive strategies besides Ramunap Red and Energy start to exist, Vampires were already a thing and really needed a better one drop. Merfolk might be able to use their new cards for push in to playability in Standard. Of course, Energy remains the end boss of the format until that changes. Hopefully that will happen with a bit of help from Golden Demise! Nice spoiler and beautiful art. 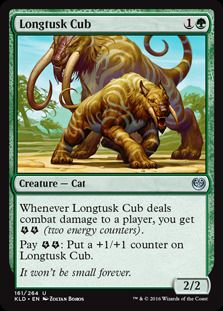 Kari Zev, Ragavan, Ferocodon and Hazzie are all having a party now, given that players will be adding this card to their sideboards to deal with the Legion of Dusk and River Herald tribal decks. 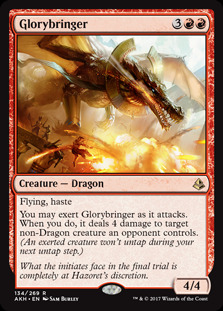 People will still consider bringing in this card against Ramunap Red post-board because it does hit some threats, but red mages will probably just take their normal line of "going bigger" post-board which will make this card even less scary. 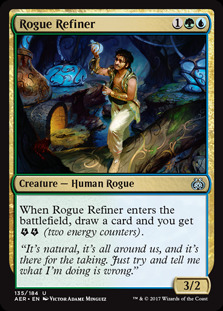 And Energy is not bothered by this card as you say. This card is to help us handle the new kids in the block.